Paul Wood's photos: On the way out, and on the way back. The Auld Lang Syne goes from strength to strength and welcomes new sponsor DALESIDE BREWERY of Harrogate. 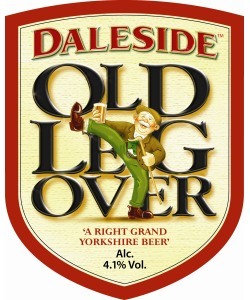 All finishers will receive a bottle of 'OLD LEG OVER' beer. This is a smooth traditional Yorkshire beer of 4.1%, which has featured a reference to the Auld Lang Syne race on its label, how quaint the custom of 400 hardy fell runners to pick New Year's Eve to challenge themselves. 'This is an absolutely fabulous thing to have happened for this unique race, and you the runners. For the last few years Daleside have actually supported this event via Briscoe's Brewery, as Paul had to ease down production because of family commitments. Paul will still be involved with the race and was instrumental in to bringing Daleside and the Auld Lang Syne together, also his invaluable input is always a plus. Paul does intend to get back to brewing, so watch this space, we will let you know when he is at full capacity again.' commented race organiser Dave Woodhead.